In Montana, thousands of families struggle to make ends meet. One of the most promising policy opportunities to support working families and boost our economy is the enactment of a state Earned Income Tax Credit (EITC). The Great Recession and other economic trends made it harder for Montana’s families to live above the poverty line. In fact, Montana has over 27,000 families that are working but are below or near the poverty line. A sluggish economic recovery increased the struggles for low-income families. In addition, the Montana income tax system taxes families at an annual income far below the poverty line, pushing them further into poverty. 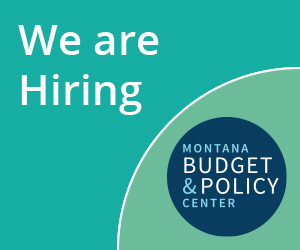 The federal EITC program has been the most effective anti-poverty program in history, and a state-level credit could provide the same benefits to Montana families. >>>Read our full report on the Earned Income Tax Credit and how it could help working Montana families.